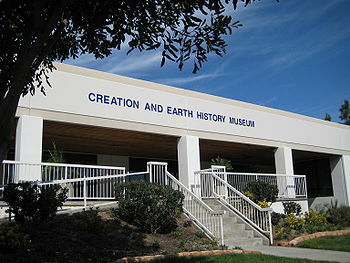 The Creation and Earth History Museum is located in Santee, California USA. The museum is free of charge and visited by schools on field trips, youth groups, church study groups, and those interested in the creation/evolution debate. Its 4500 square feet exhibition floor provides a unique educational opportunity that is consistent with Biblical history. Visitors pass through several rooms with displays, collections, and art depicting history in chronological order. The displays begin with the creation of the universe and the earth by God on Day 1 and the last room displays current scientific research by creation scientists. Other topics covered in the museum are the fall of man; the worldwide flood and resultant Ice Age; the beginning of nations; ancient civilizations; the life, ministry, and resurrection of Jesus Christ; the Reformation and advent of science disciplines; and the hall of scholars featuring famous people on both sides of the creation/evolution debate. The museum was designed and constructed by the Institute for Creation Research. It was formerly known as ICR's Museum of Creation and Earth History. It opened in its present location in 1992 and was run by ICR until 2008. The Creation and Earth History Museum is now owned and operated by Life and Light Foundation, a non-profit 501(c)(3) ministry. CLOSED: Sundays and major holidays. For dates of closures see the museum website.